When it comes to choosing the right case for your drone, it’s always a tricky decision. Hours upon hours can be spent flicking through an endless amount of cases with no success. ​But, that’s why we’re here. We’ve scoured the Internet to bring you this list of the best DJI Mavic Cases currently available, taking into account both their price and the protection that they offer. Whether you’re in need to a professional standard hard case or a small and compact backpack, our list of the best DJI Mavic Cases has you covered. First up on our list of the best DJI Mavic Cases is the KUUQA Hard Shell Carry Case. 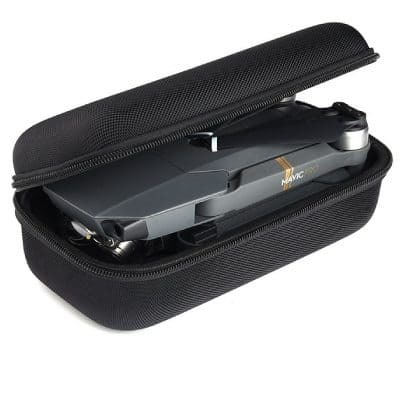 This hard shell case maintains the compact design of the Mavic Pro and provides the perfect solution for transporting your drone safely and securely. The case comes in three parts, one case for the drone, one for the transmitter and a sleeve for a spare battery. They’re extremely lightweight, weighing a combined total of 0.3kg. 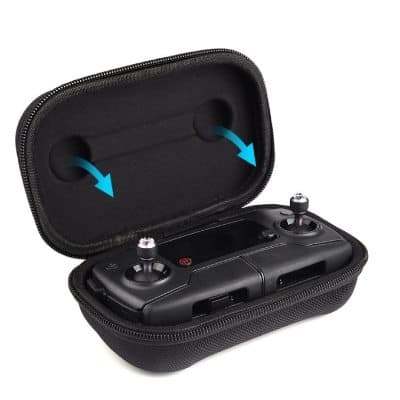 This makes them the perfect cases for any of you who’s frequently travelling with you’re drone, especially if you’re planning on walking long distances. Don’t let the KUUQA’s small and compact design fool you; its water and dust resistant material provide the perfect protection for your Mavic whilst you’re on the move. It’s hard shell exterior paired with its durable EVA interior make a safe home for your drone whilst you’re travelling. The transmitter case has 2 controller stick holes, which stop vibration from case moving your sticks whilst you’re travelling. 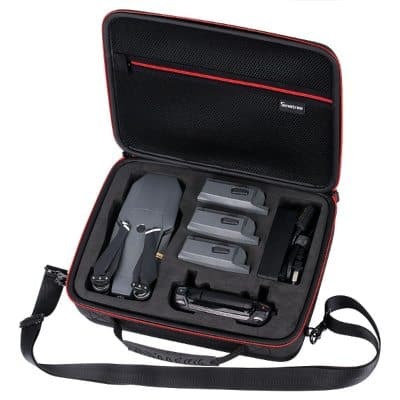 As we discussed earlier, the KUUQA carry case comes in three parts, one case for your Mavic Pro, one for the transmitter and a fireproof case for the battery. If you’re a pilot with a lot of accessories then perhaps a case for more storage capabilities is for you. The KUUQA is designed for those of you who are looking for a cheap and practical way of transporting your drone and transmitter. The lack of storage can be either seen as a good or bad thing, depending on what you’re looking for from a case. If you’re a traveller and space is a major factor for you, the KUUQA is a great option, its light, cheap and protective. Easily one of the best DJI Mavic Pro cases. Next up we’ve got the DJI Mavic Pro Waterproof Backpack. This is perfect for those of you who are going to be doing a lot of walking with your Mavic Pro and need a case that can hold your accessories as well as your drone. Lets take a closer look at why this is one of the best DJI Mavic Pro cases around. The case has an extremely tough hard shell exterior that’s also waterproof. This is a big bonus, as you never know when you’re going to get caught out in the rain. The inside of the bag is made from impact absorbing foam that has custom holes cut to perfectly house the Mavic Pro and its accessories. There is also a strap that is used to further hold the drone in place whilst it’s on your back. All of this combined makes an extremely protective and portable backpack for your Mavic Pro. The beauty of this backpack is that is allows you to fit a good amount of accessories, whilst still maintaining a compact design. This is great if you’re planning on flying with your drone, although it’s always worth checking out your airline carry on limits before you fly. You can get an idea of check-in luggage sizes here. This case can fit a Mavic Pro, a controller, 4 batteries (one in the drone), iPad, SD cards and charging cables. Not a bad amount considering the size of the bag and how easy it is to transport around. Next up on our list of the best DJI Mavic cases is the Nanuk 920, which is a professional standard hard case for your drone. 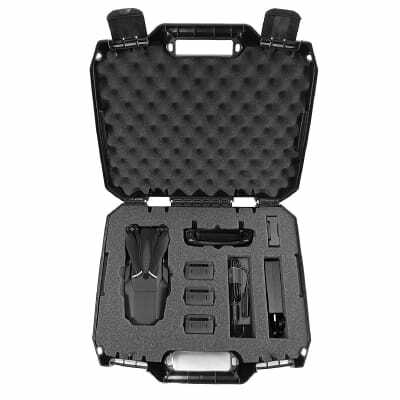 If you’re frequently out in the field visiting an array of locations, the 920 case will serve you perfectly. So, why is the Nanuk 920 one of the best DJI Mavic Pro cases? Lets find out. 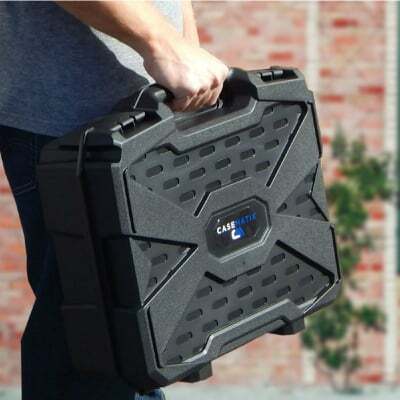 The cases solid exterior is tough and high impact resistant, designed to handle heavy collisions with no adverse affects to either the case or the equipment inside. The Nanuk features a power claw latching system, which is used across all of their models. This keeps the case shut even in the toughest of conditions. The case itself has a waterproof IP 67 rating, which means that it can be submerged in water at 3ft for 30 minutes and the drone will be fine. Although, I doubt you’re going to be taking a swim with your case anytime soon, it’s nice to know you can. Basically, this case is manufactured to keep your precious Mavic Pro safe, even in the most extreme conditions. The inside foam is custom cut to fit the Mavic Pro and its accessories perfectly, this means that they’re not going to come lose during transportation. The inside of the lid is also lined with a layer of foam to stop your equipment from banging on the hard material of the case. The Nanuk offers ample room to store your drone and accessories, with space for 3 batteries, transmitter, charger, Mavic Pro, ND filters and SD cards. Overall it’s safe to say the Nanuk is one of the best DJI Mavic Pro cases around. If you’re going to be out in unpredictable conditions, it’ll do a fantastic job of protecting your drone and accessories. ​I struggled to think of any cons for this bag, although I’ve heard in a number of places that is has a strange smell. I wouldn’t take that too seriously though. The SmaCase D500 is the first of two Smatree models on our list of the best DJI Mavic Pro cases. This is the larger version and offers pilots a portable and protective way of transporting everything that you need for a successful flight. The Smatree D500 is made from high density EVA material that is both durable and lightweight and offers fantastic protection for your drone. 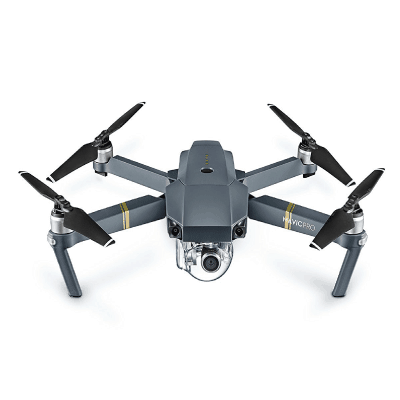 The Mavic Pro is held in place by the custom designed foam, which not only stops the drone from moving around inside the case, but also acts as an extra layer of padding. The Smatree D500 has received a lot of praise around the world for the protection it offers the Mavic, receiving an abundance of 5 star reviews on Amazon. You wont be short of space with the D500 either, it offers enough room to store all the essential equipment for flying. Inside the case you can fit a Mavic Pro (with battery inside), 3 batteries, spare props, transmitter, iPad, SD cards and ND filters. The main body of the bag stores the Mavic, battery and transmitter, whilst the mesh pocket can be used to store the remaining equipment. 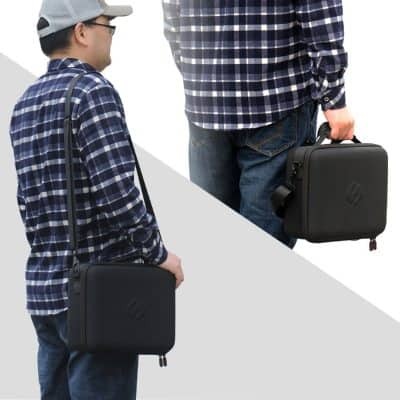 The case also has an adjustable shoulder strap and a carry handle so it can be carried as either a shoulder bag or a briefcase, depending on what you’d rather. Taking into account price, protection and portability, the SmaCase D500 is undoubtedly one of the best DJI Mavic Pro cases out there. 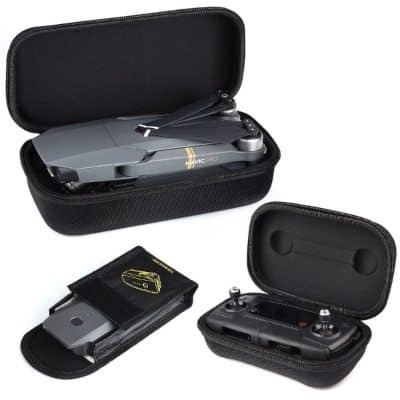 Now, this is without question on of the best DJI Mavic Pro cases currently available. 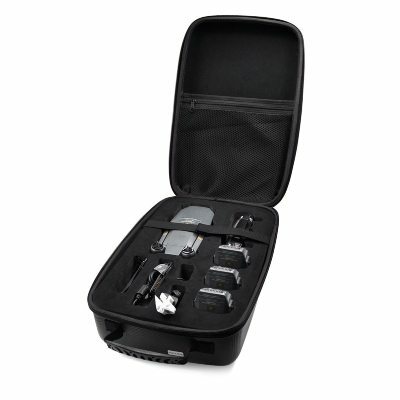 Made in the US, the Case Matrix Carry Case is the number on best selling RC case on Amazon, and it’s no wonder why. It’s unbelievably affordable, for less than 40 bucks; you’ve got one of the highest quality cases in the world for your Mavic Pro. Let’ take a closer look at what makes this case so special. 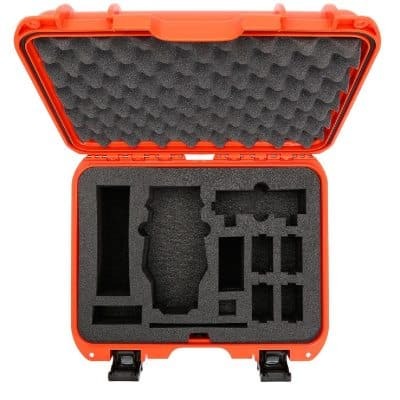 The exterior of the Case Matrix is manufactured using durable composite injection plastic, which creates an extremely rigid and durable frame. This will protect your drone from the inevitable bumps and knocks that it will encounter whilst you’re travelling. The interior is filled with tri-layer foam that cushions both your drone and its accessories inside. The inside of the lid is also lined with a layer of foam, which prevents your drone from knocking against plastic whilst you’re on the move. One of the best things about this case is the amount of storage space that it provides. 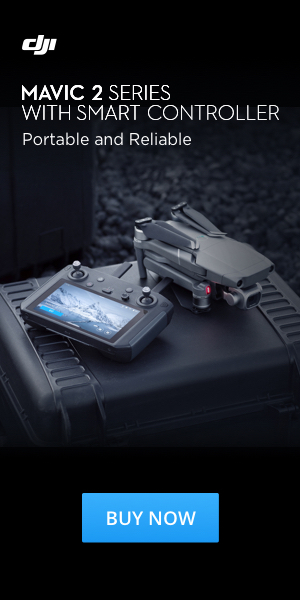 The case itself is able to fit all the accessories that come alongside the drone in the fly more bundle. 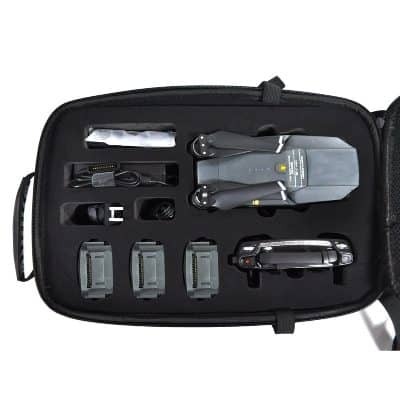 In fact, the Case Matrix is able to store a DJI Mavic Pro, transmitter, charging hub, adapter, 4 batteries (one in the drone), propeller and cables. If you have any other accessories such as ND filters, you can always cut your own hole into the foam. Overall, it’s easy to see why this is the number 1 best seller on Amazon. The quality of the case, paired with is crazy cheap price tag make it easily one of the best DJI Mavic Pro cases! Well that’s it for our list of the best DJI Mavic Pro cases. We hope you’ve found this helpful and that you find the right case. As always, if there’s anything you would like us to add or review, please leave a comment or drop us a line at [email protected]riot.com.